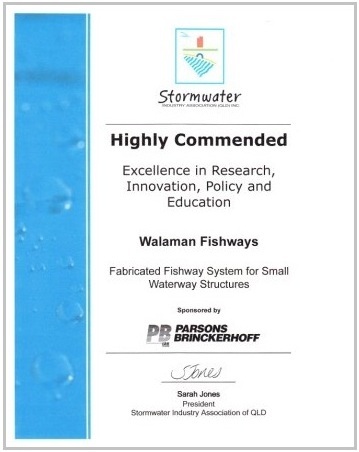 Walaman Fishways were awarded Highly Commended for Excellence in Research, Innovation, Policy and Education at the Stormwater Industry Association Queensland (SIAQ) 2010 awards night recently held at the Urban Hotel in Brisbane. The SIAQ awards are part of a national awards program conducted by the Stormwater Industry Association to provide recognition and celebrate excellence in innovative developments and projects in stormwater. 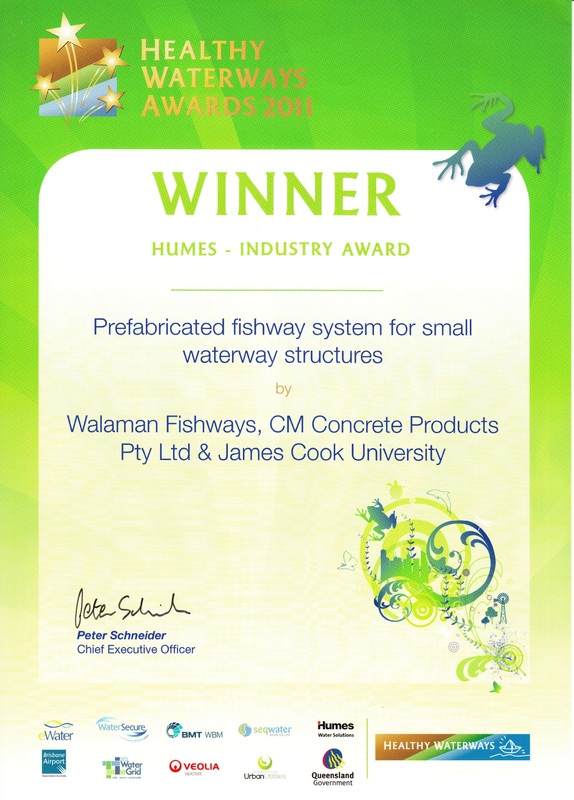 The Walaman award recognised the suitability of the prefabricated fishway system for a range of waterway structure types and configurations. It also acknowledged the provisions made in design to allow ready integration of the Walaman system into the waterway structure to meet fish passage and other multipurpose design requirements for the site. Ongoing design, development and evaluation work that is now underway will ensure the best hydraulic and biological performance of the fishway in new projects, and increase the opportunity for uptake of the Walaman system in the stormwater industry. The Bennett Road culvert crossing of Enoggera Creek in Brisbane represents a barrier to upstream fish migration due to high velocity, shallow flow, water surface drop, and lack of resting place for fish. This structure represents a barrier to aquatic fauna connectivity between habitat areas in the creek and prevents migration from downstream to upstream reaches for more than 6 species of native freshwater fish. The Walaman prefabricated fishway system has recently been installed to provide for upstream fish passage and to overcome the fish migration barriers for a range of flow conditions at the culvert.